The Musketeer is Hollywood thinking in action. "Martial arts stunts helped a sci-fi film like The Matrix and a Shakespearean-esque tragedy like Crouching Tiger, Hidden Dragon. What other genres can we subvert?" Unfortunately, they picked the classic tale of the Three Musketeers to add some action sequences and didn't give much thought to how well the stunts would fit into the story itself. 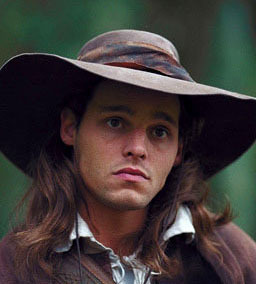 The Musketeer stars Justin Chambers, a poor man's Paul Walker. When we consider that Walker himself is a poor man's Keanu Reeves and realize we're two generations down from that, I think it's OK to weep for the acting community at least a little bit. Surely there are some actors serving coffee at Starbuck's right now who can do better than this. Anyway, our young protagonist wants to be an action hero, but instead comes across as more of a Chris O'Donnell-as-Robin type of guy, and since the film hangs on his performance, we can already tell the movie is in trouble (We interrupt this review for an important question: Why do musketeers never have muskets? They always have an epée or a foil or a saber, but never a musket. Does epéeteer not have the same ring to it or something?). I assume that almost everyone reading this is familiar with the story of the Three Musketeers, so there's no point in discussing the backdrop for the story other than to say that the film begins by showing D'Artagnan as a boy who witnesses his parents killed by the evil Febre, played by the wonderful Tim Roth, a hired assassin of Cardinal Richelieu (Stephen Rea). In the skirmish, the boy demonstrates that he has the heart of a warrior by stabbing Febre in the eye and forcing him to wear a menacing patch the rest of his life. The scene theoretically gives both the villain and the hero a reason to desire revenge and sets the table for a quality action-adventure flick. Alas, the film really never goes anywhere from the next scene, where we first see D'Artagnan as a man, to the time when their climactic duel is fought at the end of the movie. All that occurs is the usual storyline of a young fighter with great skill proving himself to those who originally scoff at his skills but later come to appreciate and respect him for the accomplished soldier he grows to be. It's wildly generic and I believe it's this knowledge which caused the stunt sequences to be so heavily emphasized in the marketing campaign. Obviously, the overall quality of the motion picture should be graded based in large part upon those sequences and they do add quite a lot to the film. As you are probably aware, legendary Asian stunt choreographer Xin-Xin Xiong is responsible for the work here, and frankly, his styling is the only saving grace in an otherwise atrocious film. The sequences he creates cycle between the dazzling, the sublime and the incoherent. From the opening bar fight, where our hero takes on first a single foe then two, three and four as he dances among the beer kegs and flies from the ceiling, to the jailbreak, where the Musketeers join forces for the first time with him, there are high spots which make the audience ooh and ah. Unfortunately, the choreographer didn't ever figure out a way to top himself, so the film ends with a simply ridiculous swordfight on the side of a tower, where the duelists only occasionally realize that the easiest way to beat the opponent would be to CUT HIS ROPE. In the interest of extreme stunt work, logic is thrown out the window at several points, and it makes the film's action scenes less enjoyable. While the closing duel is pleasant, it's a case of too little too late in an otherwise forgettable film. A comparison I would make for The Musketeer that some of you might understand is that of an ECW wrestling match. Rather than build a story slowly and progress in a natural timeframe, a decision was made here to instead slap together a lot of high-spot sequences in hopes that the audience would overlook the other flaws. Had Stephen Rea and Tim Roth instead been given time to be more than run-of-the-mill bad guys more could have been done, but for some reason, we get a lot more of Justin Chambers and way too much of Mena Suvari instead. In fact, I'm going to be polite here and not spend six paragraphs butchering her performance, but let's just say that for some reason, she's a hotel maid who happens to be bestest buddies with the Queen, and that's not even the most ridiculous leap of faith required to accept her character. Plus, her chemistry with Chambers is so bad that I'd more readily accept that he was in love with Aramis - or even Cardinal Richelieu, for that matter -before I'd buy that the two of them are in love. It's just a mess of a story that has been slapped together as a lame excuse to show cool stunts and so it's impossible to recommend. The Musketeer is a mistake, and a cautionary tale about the "re-imagining" of previously well-done Hollywood movies.